The night sounds in mid summer change noticably. Earlier, just about dark you could hear lots of frogs in the fish ponds. Now, it's the cicadas, tree frogs, occasional whip-poor-wills. Even if the sounds were recorded, one could tell by listening, just what the season is. You can also tell the season by what's in bloom and the butterflies that are visiting. 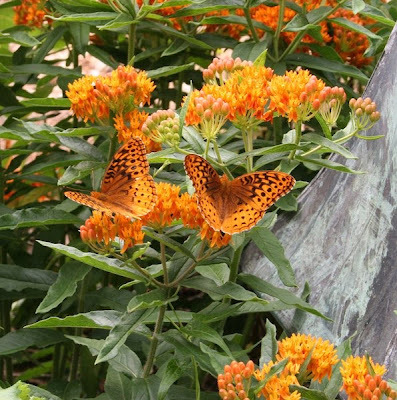 Above, butterflies are enjoying their mid-morning nectar from the butterfly weed (Asclepias tuberosa). The black swallowtail butterfly, also feeding on butterfly weed, is just one of dozens in my garden at present. Swallowtail larvae spend their time on parsley, dill and fennel, eating a leaf or two before pupating into the butterfly you see above. Can you believe it? 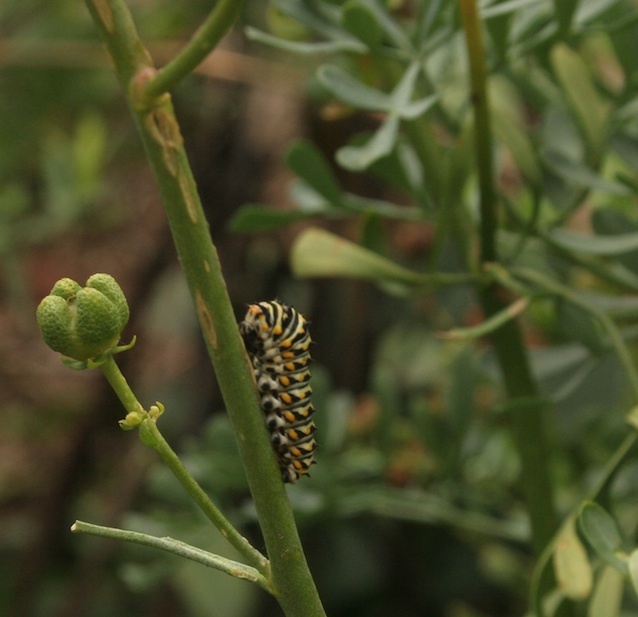 Ignorant people actually spray these caterpillars to kill them! Monarch butterflies lay their eggs on butterfly weed, or nearby. 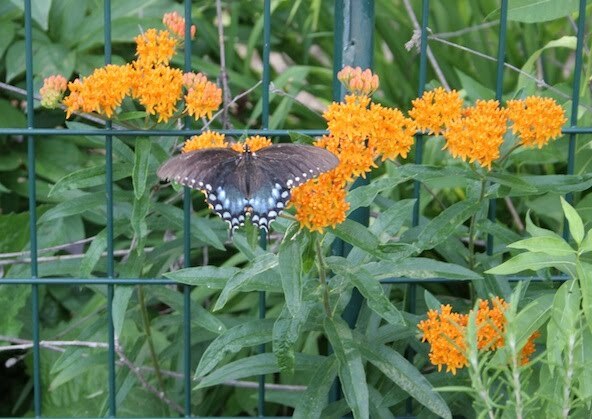 This one is enjoying life on my rue plant right next to the butterfly weed. Little does the caterpillar realize he, or she, will have to eat voraciously for the rest of the summer to prepare its strength for the long flight to South America before frost, then make it back in the spring in time to lay more eggs. (To see one very tired, pale monarch that barely made the trip last year, see my photo here). Speaking of butterflies, Ann McCormick qualifies for that description. No, not a caterpillar, a monarch butterfly. She's a fellow-self publisher, following her passion for herbs and cooking and writing prolifically. Her very popular e-newsletter goes out to herbal enthusiasts across the blogosphere, and her tips, recipes and herbal ponderings are popular with her readers. 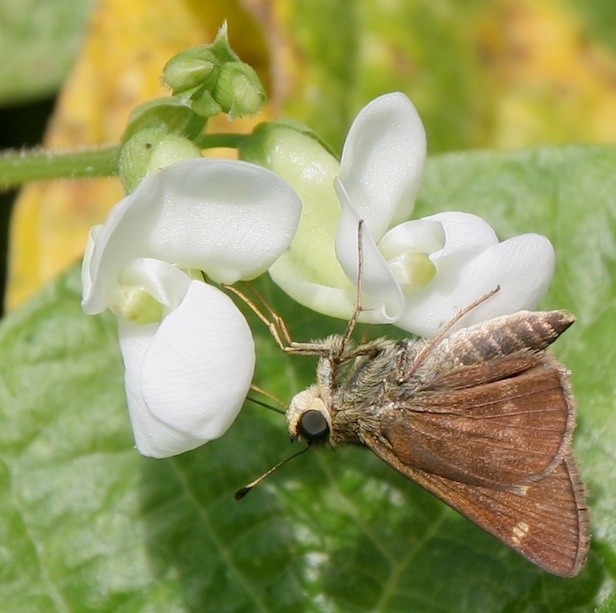 You can read and follow her Seasonal Living newsletters here. Ann also writes a bi-monthly column for The Herb Quarterly magazine. Ann has a new book, the 10 Must-Have Herbs for Cooks. It's chock full of her great recipes and lots of good information for growing and harvesting herbs. Ann bills herself as the Herb'n Cowgirl and is a life-long Texas gardener. 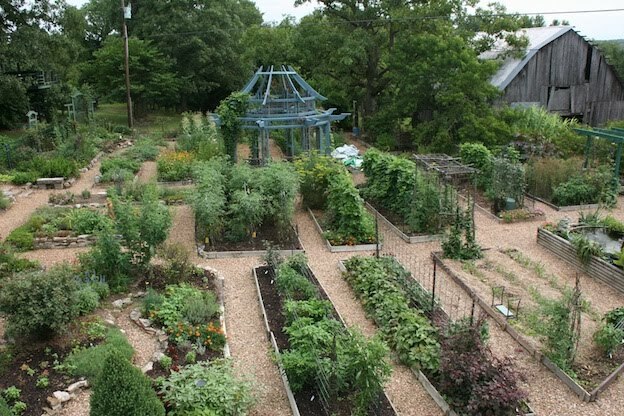 She lives in Ft. Worth, which isn't the easiest place in the world to garden. 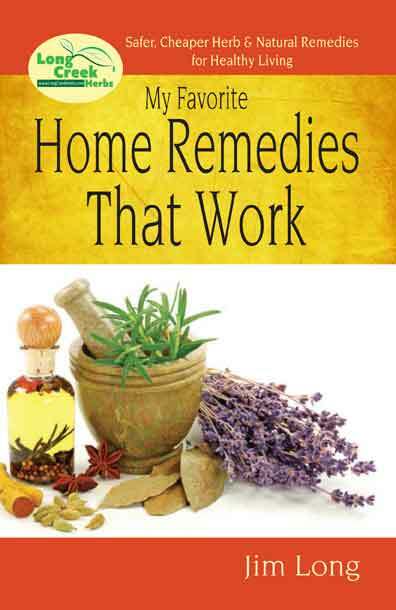 10 Must-Have Herbs for Cooks is available from Amazon, and at the link above. Here's one of Ann's recipes for you to try. Dilly Potato Salad (in honor of dill, the Herb of the Year). Combine potatoes in water, bring to a boil, simmer until tender. Blanch snow peas in boiling water for 15 seconds. Drain and rinse immediately in chilled water. In a small bowl combine the water, white wine vinegar, vegetable oil, dill and sugar, mixing well. Pour over the other ingredients, mixing lightly. Chill at least an hour before serving. Very tasty! We're off to Austin, TX, a city not far from Ann's hometown, to see what wonderful gardens we can find - it's one of my favorite cities. Details to come. The red seeded Chinese noodle beans are producing like crazy. Every other day our 6 ft row produces 3-4 pounds of beans. That''s today's picking, above. Most beans average about 16 inches long. 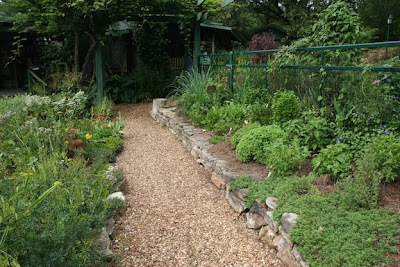 I sometimes get a bit aggravated at hearing the same question from visitors to the garden, "But what do you do with them?" I resist raising my voice and saying - They are BEANS, think about it, what do you normally do with BEANS? But I don't. I just explain, they are BEANS, you cook them any way you cook any other green bean. They snap, with no strings, the large ones can be shelled if you choose, you can eat them in any size from 5 inches long (that's one day old) to 16-18 inches (that's a 3 day old bean). 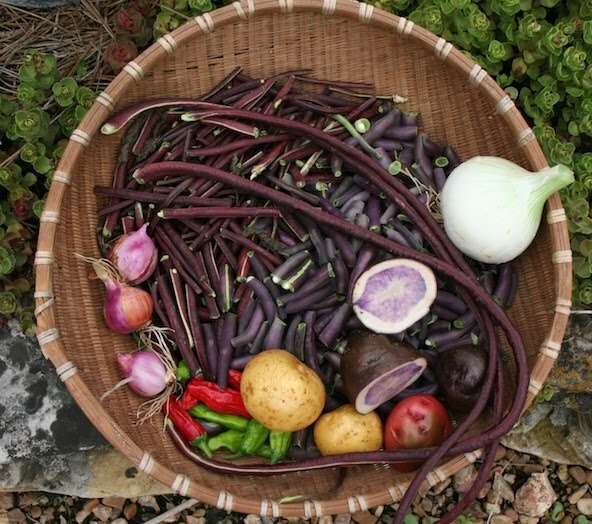 Boil, saute, steam, stir-fry or freeze, they are simply BEANS, and my favorite of all the beans I grow. They will keep producing right on to frost if I keep the beans picked. (You can order them from Territorial Seed, as well as Baker Creek Seed and others). 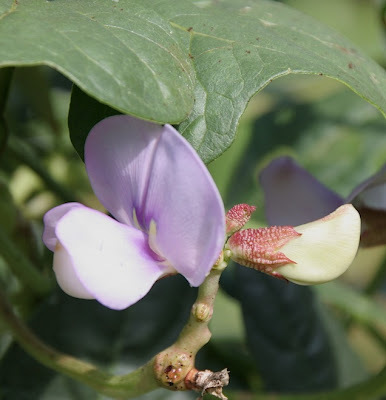 Not only is this an outstanding bean, the flowers are attractive, as well. 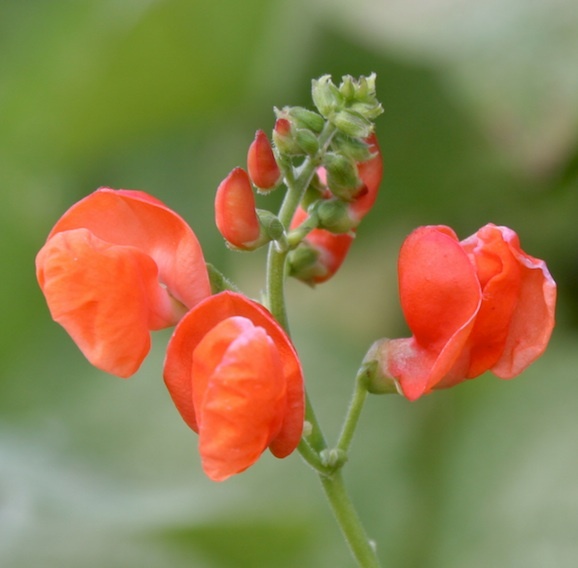 They bloom in pairs, which means there are always two beans per stem, which is handy for picking. As the flower wilts by the end of the day, it becomes almost blue instead of lavender. Another bean I'm growing again this yesr is this one, above, which I've written about a few times before. It's a Seneca Bear Bean, a Native American heirloom bean, traditionally used when cooking bear. Since I don't cook bear, I like them cooked most any other way. They're a shelling bean, ready in the fall after they have dried. (For photos of the beans, go here). 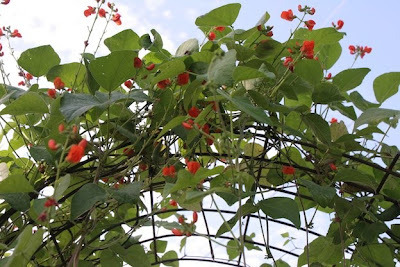 I grow the Seneca beans on an arbor between two raised beds. It makes the beans easy to pick, plus shows off the attractive crimson flowers, which are in bloom all summer long. And here, the blossoms of Missouri Wonder pole bean. 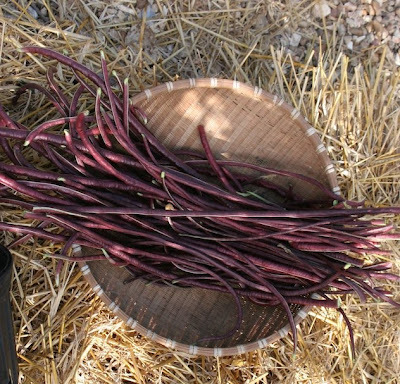 It grows next to the red seeded long beans, same amount of space, but the long beans outperform the Missouri Wonder beans by 100 to 1. It's an old, reliable heirloom variety, good for shelling beans primarily, but not a heavy producer most years in my garden. The flavor is beefy, hearty and worth the effort of growing it, however. The beans, shown below, are an old favorite from long ago. The garden today - bright sunlight makes it look dark. Click on the picture to enlarge it. 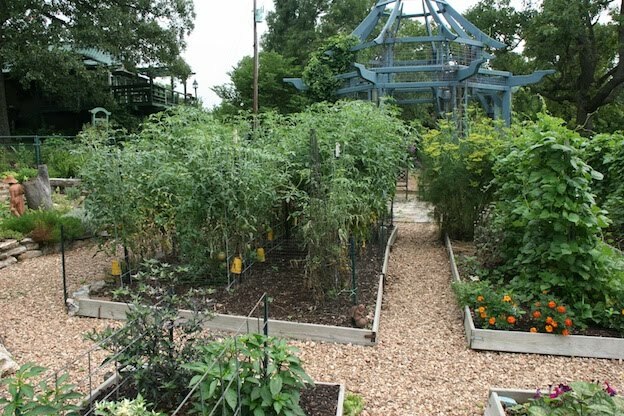 You'll notice sheets and a picnic umbrella to the right - coverings for the tomatoes so they don't sunburn. Stay cool if you can. Above is the Herb Shop with bell tower and tiny viewing deck, above. Sometimes all the planets align, the weather cooperates and the garden grows. Yes, there are weeds, especially a variety of so-called spurge. 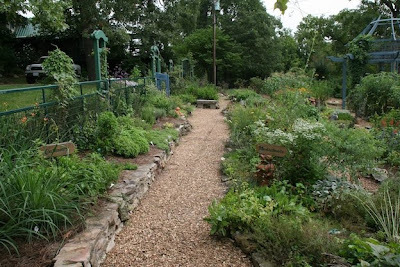 But otherwise, a few bugs, too much rain and a lot of heat and humidity, are only small issues, I want to give you a tour of this summer's garden. 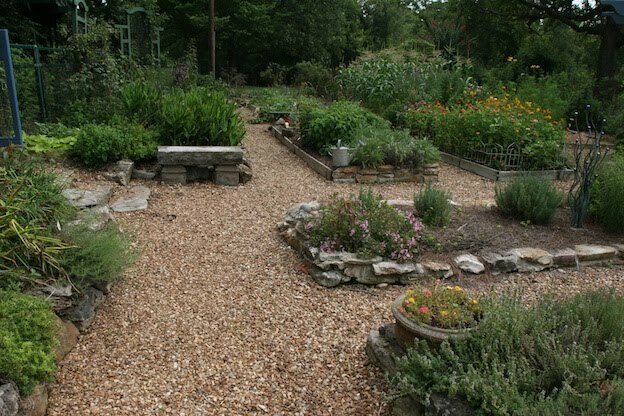 Thanks to a lot of work from Adam, Josh, me and The Fates, it is a GOOD garden. There are two blue gates that you can enter through. This one (above) has a series of bells as weights, to make it self-closing. 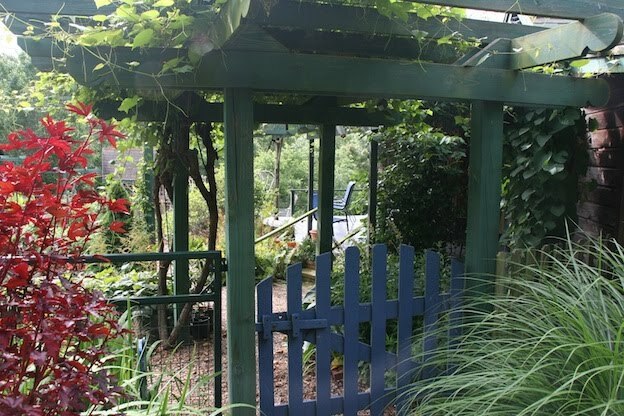 On the left of the gate is the red-leaf hibiscus (Hibiscus acetosella) and overhead is the grape arbor with wild grapes and muscadines. If you climb the bell tower above the Herb Shop and look down on the garden, this is what you will see, a partial layout of the garden beds. If you look us up on GoogleEarth, this is also the view but from directly above, via satellite. 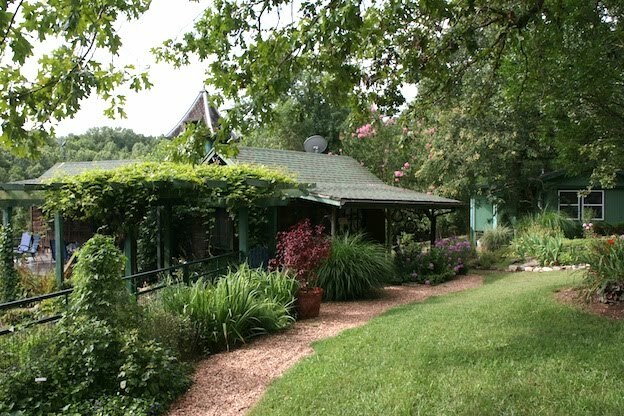 Looking over to the right (east, toward the Long Creek arm of Table Rock Lake) you'll see the old barn where the goats and chickens live, the garden shed and the little water garden. Native medicinal plants are on the left, some of the culinaries on the right (grape arbor straight ahead, blue gate on the right). Notice there are trellises along the fence on the left. Pathways are gravel and wheelchair accessible. Edible flowers bed with grape arbor in the background. The early blush of roses are over, the Japanese beetles devastated the flowers but they're about done with, and the roses will be back in bloom, shortly. 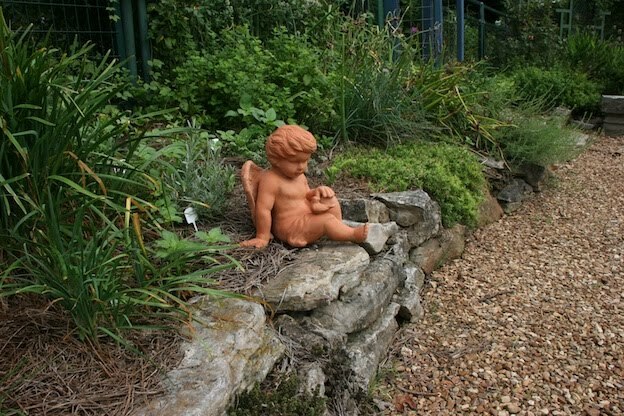 A garden angel resting on the rock wall next to the chives and Mexican mint marigold (Tagetes lucida). You can't see the goldfish pond in the middle, but this is the bed that Bessie, the box turtle has been coming back to for the past 28 years to lay her eggs. The gazebo is in the background, which has a variety of vines growing upward. Ahead is the Myoga ginger bed behind the bench. 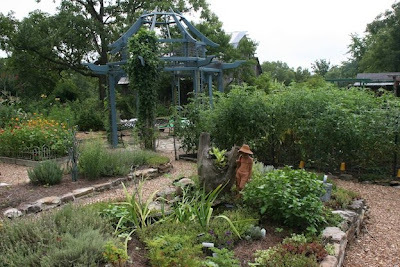 To the right is a bed of all salvias and the lengthwise bed to the right is mostly lavender. I'm growing 17 varieties of hot and super-hot chilies this year. No, that's not an outhouse in the background. 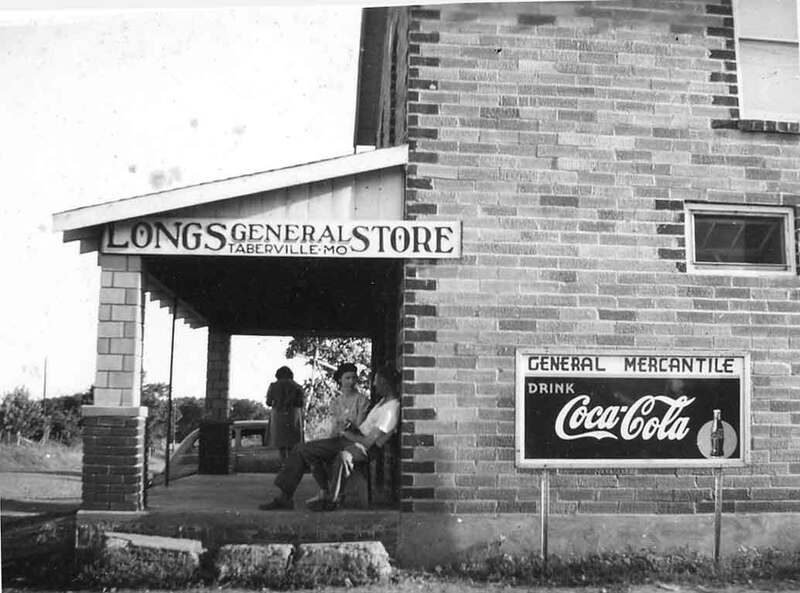 It was once a ticket booth for the Boone County, AR Fair. I rescued it from a ditch and it serves now as housing for stacks of plant flats, pots, row covers, and an occasional pack rat, which Molly removes promptly. The tomatoes are in the old sweet corn bed. Lots of new research shows that corn leaves beneficial bacteria that tomatoes avoid some fungal problems. 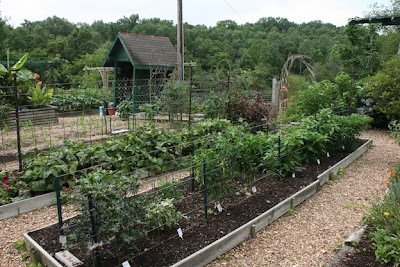 To the right is the row of Potawatamie bear beans, a Native American variety. You can barely see the deck of the house in the upper left corner. 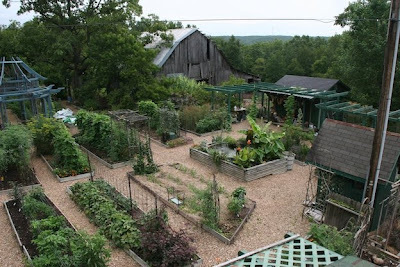 It looks down upon the garden in a nice view. 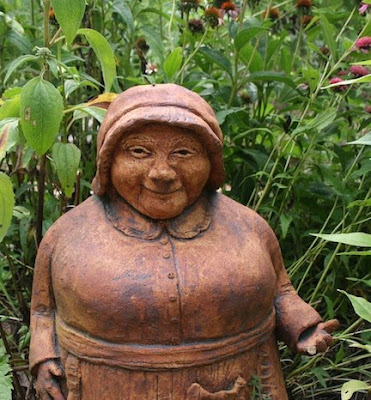 This is a statue I like because it reminds me of the late Adelma Simmons of Capriliands Herb Farm near Coventry, Connecticut. 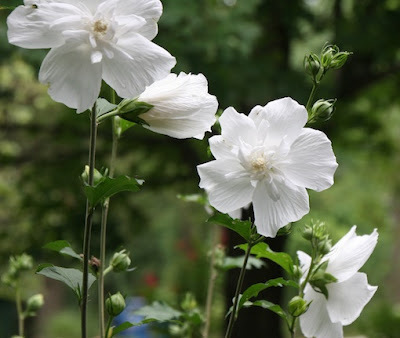 An especially elegant white althea grows just outside the kitchen door. 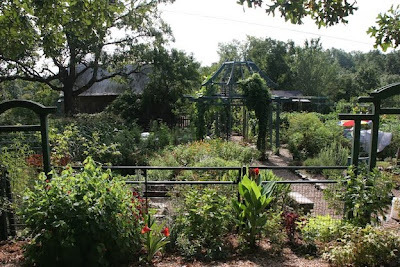 Well, there you have it, a tour of some of our gardens at Long Creek Herb Farm. We launched our new website this week. If you have old bookmarks to my books or products, they won't still work. But the web address http://www.longcreekherbs.com does work, that address has not changed. Now, when you go there, in order to place an order you have to create an account and sign in, with a password of your choosing. It's an additional step for security, as well as obeying new rules for web businesses beginning the first of July. It's an added bit of security that will help over-all, although our customers tell us it's frustrating in the beginning. (You may recall that in the past we have had no safe way to keep credit card numbers on file for extended periods, so our method has been to ask for it each time, then shred the orders afterward. The shreddings go into either the garden compost, or as nesting material for the chickens. Either way, it was safe, but this new method complies with all the regulations for web businesses. But we'll still be shredding and composting customer information, just like before. Check out the new website, and forgive the parts that still need attention. I think you'll find more to see and do, including pictures of the goats, garden, and more. Happy gardening! The 4th of July marks my favorite of all holidays. Better'n Christmas (no cards, no guilt about presents, no big commercial hoopla). Better than New Year's because it too cold then. No, the Fourth of July, Independence Day, is just right. 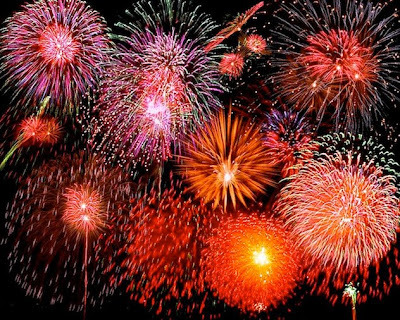 Hot weather, good food, fireworks. Oh, did I mention fireworks? What other holiday do you get to make a lot of noise and shoot rockets into the night air? And it's my friend, George's birthday. Plenty of things to celebrate. As a kid I sold fireworks from the front porch of my parents' grocery store, making enough money to shoot off a few bangers myself, but mostly to squirrel away the profits toward some bit of technology or other. Yesterday Josh and I dug the potato crop. 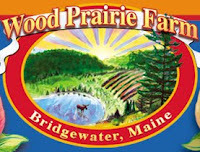 You may recall the potatoes I planted this year were the Best Blooming Potato collection from Wood Prairie Farm. I planted the potatoes later than I like, an entire month later, so they had a few potato bugs. But the plants bloomed pretty well and so on the 4th of July, the potato crop was ready to dig. We got some big, pound-sized potatoes but most were medium and small, just what I like. It seemed appropriate to have red, white and blue potatoes on the holiday. Here are a few of the potatoes in the gathering basket, along with the first picking of red-seeded Chinese long beans, which I pick anywhere from 8 inches long to 16 inches. 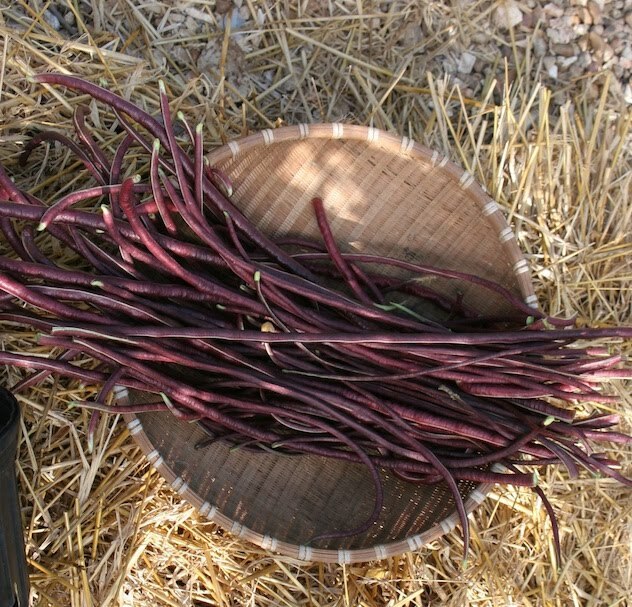 There is a handful of purple royalty green beans, too, but like every year, those have a worm in the bean every now and then. And those beans have to be stringed. I'm going to pull those up and plant something else. But the 6 ft long row of Chinese long beans put out about 3 pounds of beans every 3-4 days, way more than we can use, so I'll start leaving them on the neighbor's doorsteps. 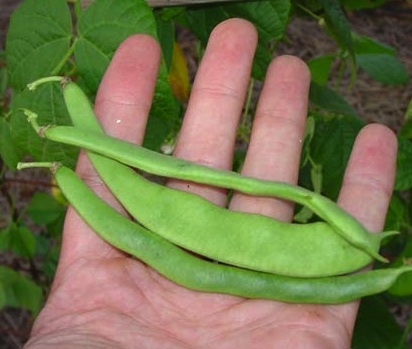 Out of the 7 bean varieties I'm growing this year, Chinese long beans are far and away the best green bean variety. I cooked the beans, potatoes, shallots and onions together with some bacon and ham, just like my Mom used to do. Josh took off today on a 2 day book tour across Missouri. He's visiting some of the characters in his book and delivering copies to the ones who made it on the cover. 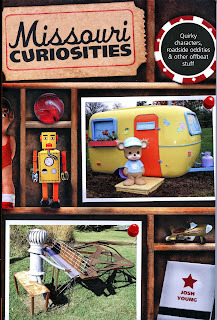 In Missouri Curiosities, Third Edition (Globe Pequot, 2010) he has once again divided the state into regions, then ferreted out all of the quirky roadside attractions, out of the way weird sculptures (and sculptors), unusual diners, strange water towers, bizarre museums, and a whole lot more. Did you know there's a Hair Museum in Independence, MO? How about the World's Largest Pecan, in Brunswick? Or the restaurant in Branson that advertised, "Pie ala mode, $250; Pie ala mode with ice cream, $3." (Really, it's true, I used to eat there). Josh's book is full of his on the mark humor, and this, his third edition of Missouri Curiosities is the most up to date guide to day trips and car excursions anywhere in the state. 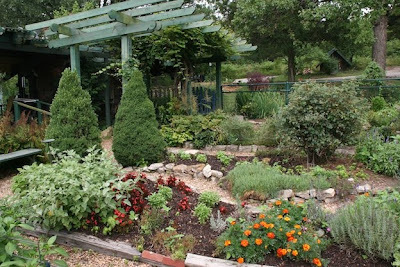 Even if you don't live in or visit Missouri, it's a fun read. 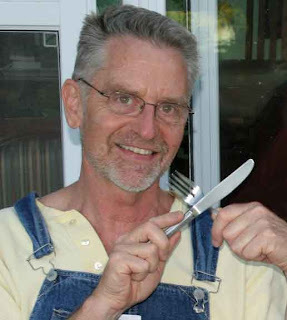 (Josh has won 3 national awards for his newspaper humor columns and with a name like Josh, you know he's full of good humor). If you are interested in your own copy of the book, contact him and he'll be glad to autograph it for you when you order. Remember my writing a few weeks ago that Matthew from the Amish Country Store in Branson brought bees to reside on the farm this year some time back? 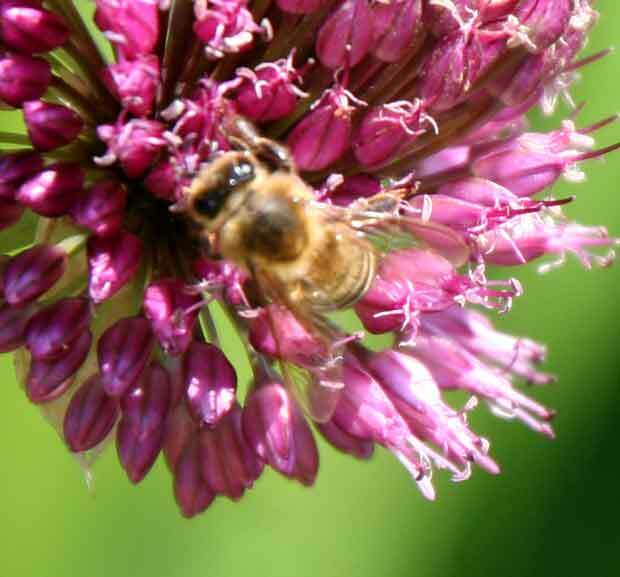 Here's one of them, the happy Italian bee, hard at work gathering nectar from a drum-stick allium flower. And, no, the honey won't taste like onion. The blossoms of this variety are sweet scented and bloom over a several week period. The bee is obviously doing it's job and we certainly are having good pollination on everything this year. Happy 4th, 5th and everyday in July. Garden season is the best of all seasons!